The Answer ALS program stretches across multiple disciplines, starting with the clinic, moving to basic science and ending with big data. Experts from each field have been carefully chosen to lead the research at every point. The figure above explains the basic program flow. Participants volunteering for the program are seen at one of the six Answer ALS clinics nationwide. Two additional clinics, The Les Turner ALS Research and Patient Center at Northwestern Medicine and Texas Neurology, are set to join the program very soon. 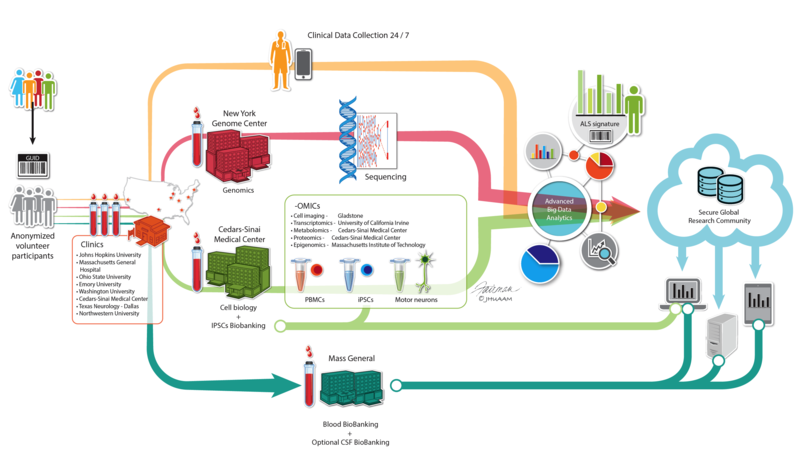 Biological samples (whole blood, plasma, serum and, optionally, cerebrospinal fluid (CSF)), are collected and distributed to our science centers at New York Genome Center (NYGC) and Cedars Sinai Medical Center (CSMC). Additional samples are banked at a biorepository at Massachusetts General Hospital (MGH). At NYGC, DNA is extracted from blood and used to sequence the patient’s whole genome. At CSMC, cells (peripheral blood mononuclear cells) are isolated from blood and reprogrammed to become induced pluripotent stem(IPS) cells initially and motor neurons ultimately. Motor neurons are distributed to the Omics science centers for deep biological profiling. Data from all arms of the program are stored, integrated and analyzed on a secure cloud server. Ultimately, Answer ALS will generate the largest and most comprehensive collection of ALS data ever amassed. This data will be made freely available to the ALS research community along with a complementary biorepository of patient biofluids to be housed at the Northeast ALS consortium (NEALS) sample repository at MGH.